This week in financial markets was a lot about gold and currencies. In what was considered a sideshow for quite some time, the upcoming Swiss gold referendum suddenly made its way to the headlines. In the absence of any reliable poll data, the ‘what if’ stories took center stage. Like most major central banks, the balance sheet of the SNB has increased significantly. A Swiss ‘yes’ would force the central bank to hold at least 20% of its balance sheet assets in gold, against just 8% now. But if this ‘yes’ happens, the real question will be whether the SNB can defend its currency cap of 1.20 against the euro. 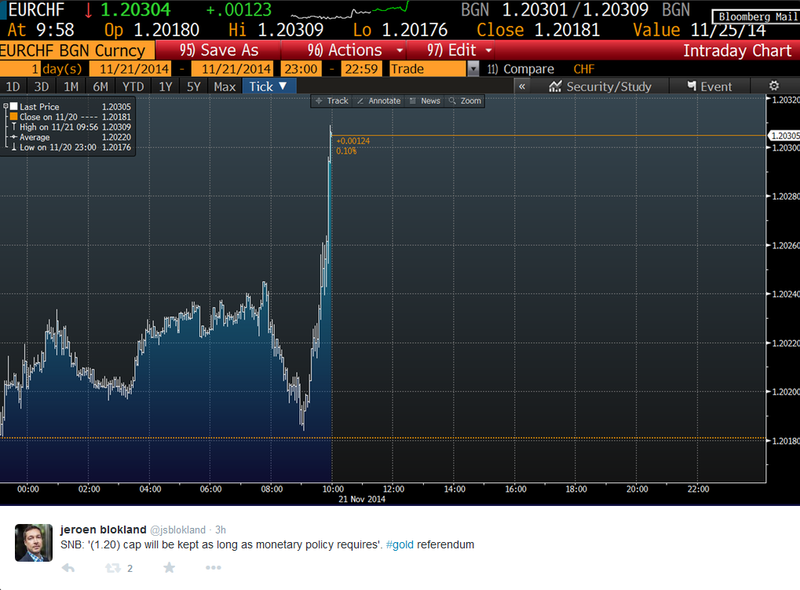 At least some of the SNB euro reserves would have to be sold, pushing the Swiss franc ever closer to the 1.20 level. However, new poll data published on Thursday showed the support for the ‘save our Swiss gold’ proposal seems to be waning. But it was only after the central bank added on Friday that it will defend the cap for as long a monetary policy requires until pressure declined, a little. 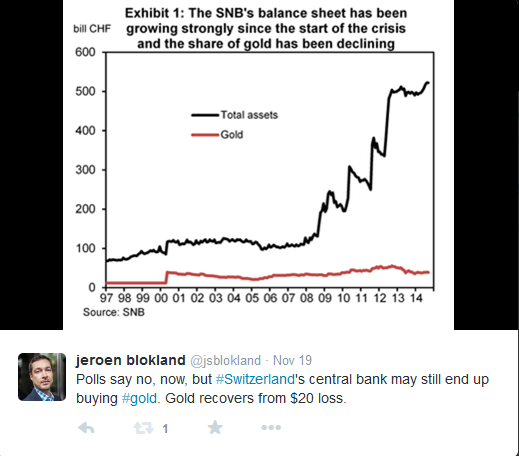 Part of the save our Swiss gold proposal is to store the metal domestically. 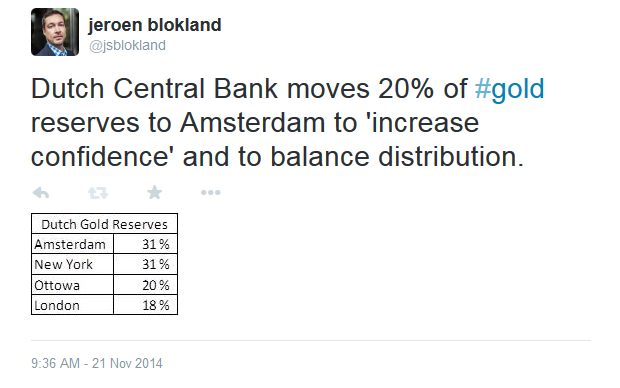 This week the Dutch central bank revealed that storing locally is probably not such a bad idea, as the central bank reported that 20% of Dutch gold reserves had been moved from New York to Amsterdam. The central bank also stated that one reason behind it was to create confidence. I am not really sure of what to make of this. 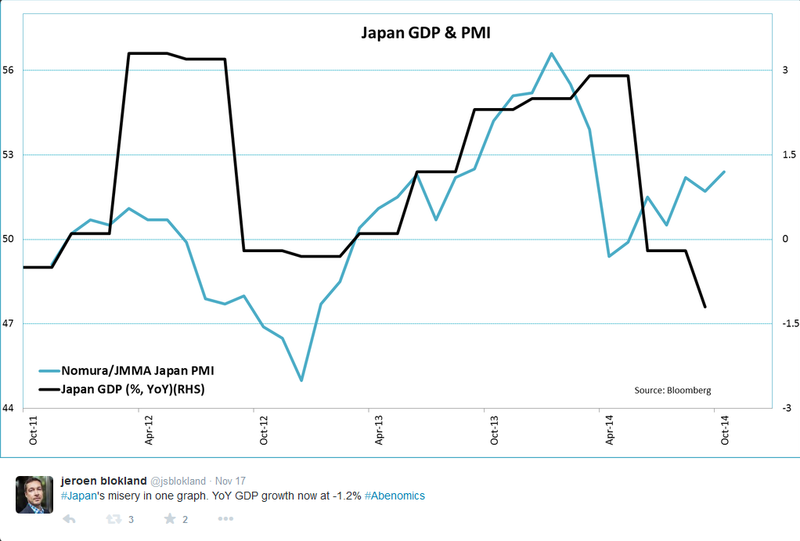 Japan opened this week with some very poor macro data. The Japanese economy fell back into recession as it demonstrated once again it has great difficulties digesting sales tax hikes. Year-on-year the economy shrank 1.2%. The horrible GDP data made Prime Minister Abe decide to skip the next sales tax hike, which was planned for the third quarter next year. On top of that, he called for new elections in what seems to a pretty safe bet he and his party will dominate the Japanese political landscape afterwards. The result? Of course the yen weakened. 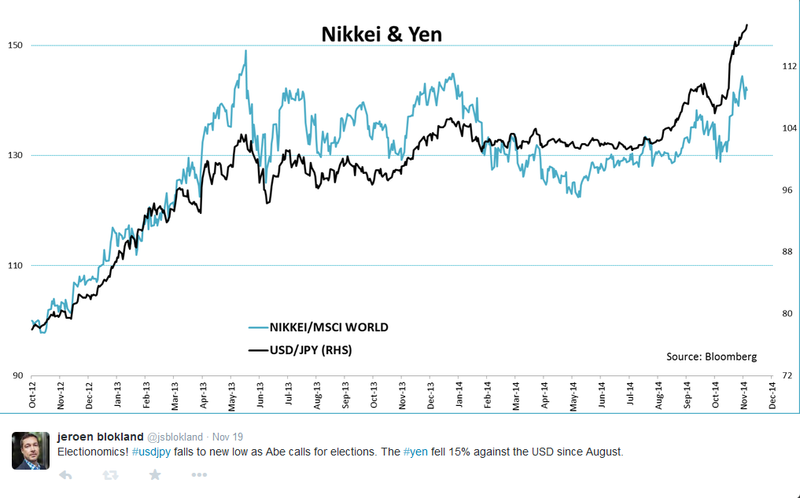 The massive sell off in the yen in recent months made me curious. Which currencies are performing even worse than the Japanese currency? Below are six of them. I would say most of the usual suspects are in there. 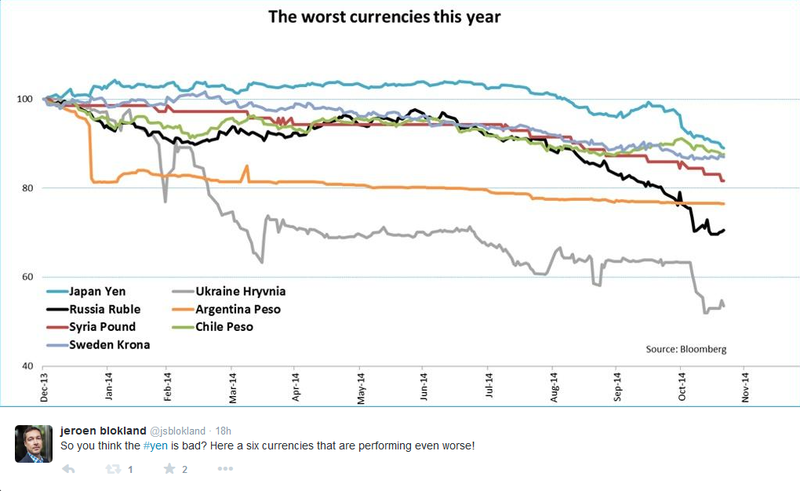 All the currencies shown in the graph above are measured against the USD. No don’t get me wrong, most if not all of these countries have obvious reasons for their depreciating currencies, but USD strength is at least part of the story as well. Look at the graph below. 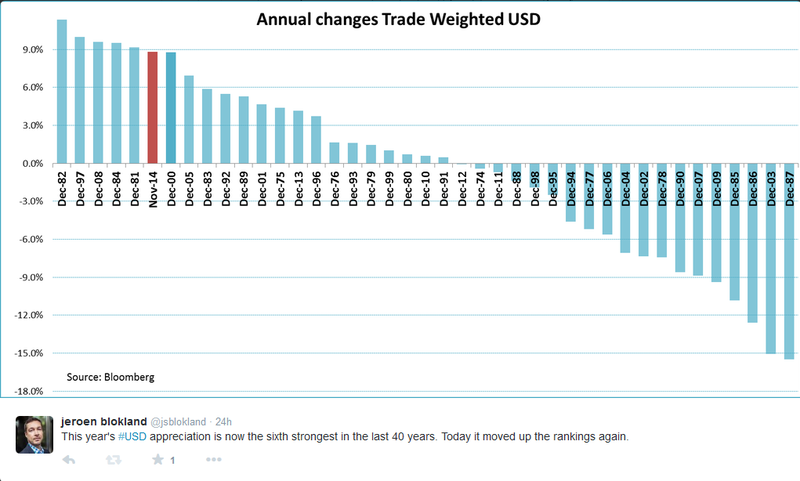 This year’s USD appreciation is among the strongest in the last 40 years. And we are not done, yet! By the way, Russia is a good example that a falling currency is not always a problem immediately. 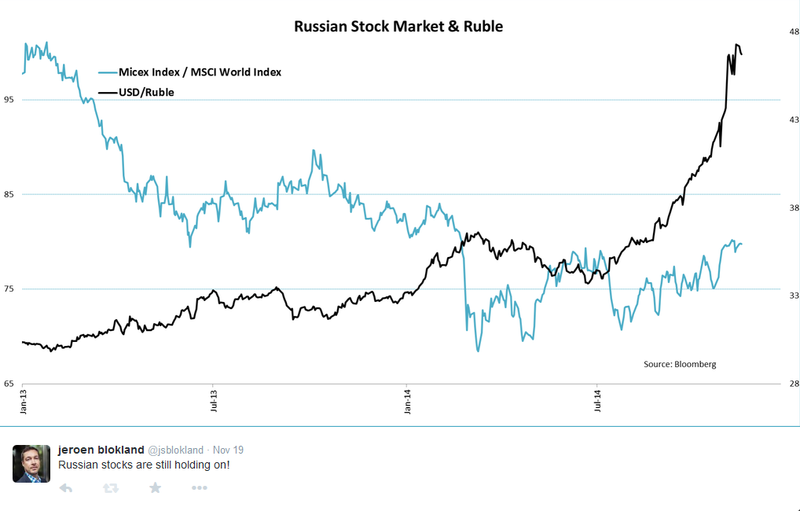 Higher inflation, lower oil prices, increasing number of sanctions, and yet Russian stocks reached the highest point of the year this week. Ok, enough with gold and currencies. On Friday, China decided to add to the already cheerful mood on the markets. In what could be considered a surprise move, the government lowered the 1-year interest rate with 0.4% to stimulate growth (the housing market correction still continues). While you could argue if this is a positive sign, the markets loved it. To put things in perspective, over the last year or so, real interest rates have increased as inflation came down quite a bit. So compared to last year, real interest rates are actually higher. The China move could be a blessing for oil prices. 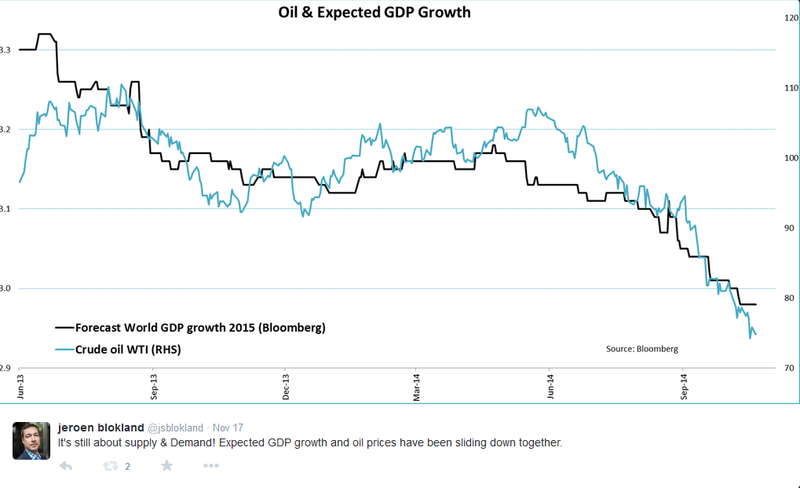 As the chart below shows, oil prices are not only about some cartel producing only one-third of the world’s oil, but also about demand. 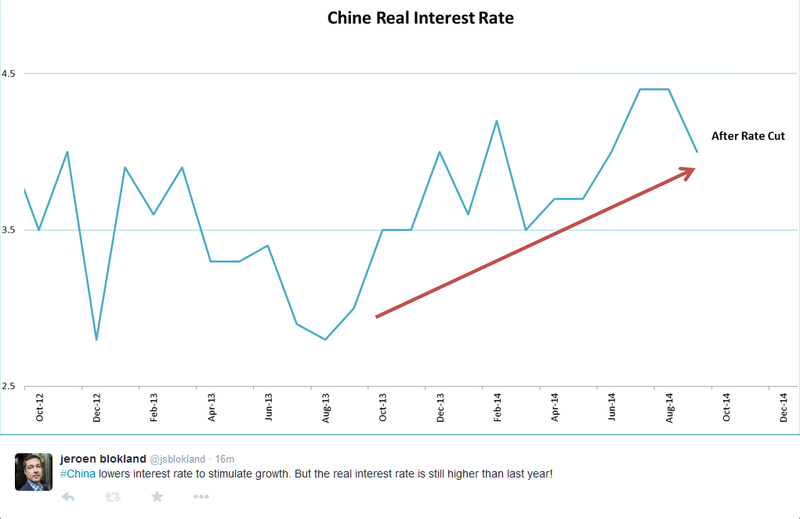 And lower interest rates indicate China wants to give growth a boost. Oil prices rallied after the rate cut news. Longer-term, though, China’s GDP growth is bound to slow. The Barclays chart below provides a nice end to this Week End Blog. 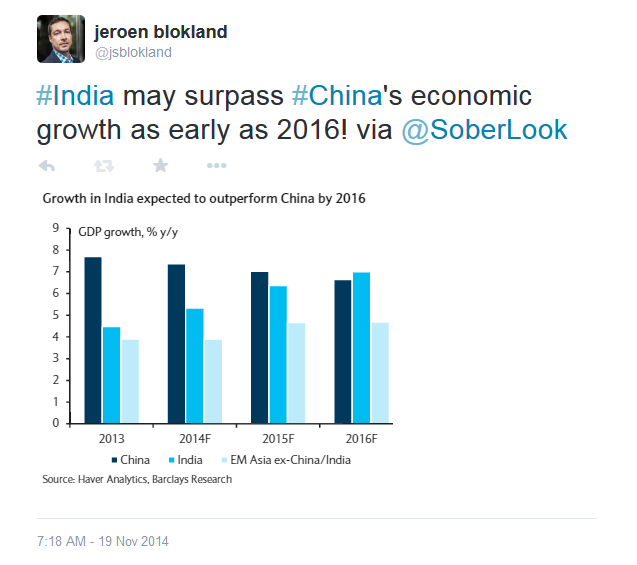 Barclays expects that India could overtake China as early as in 2016.